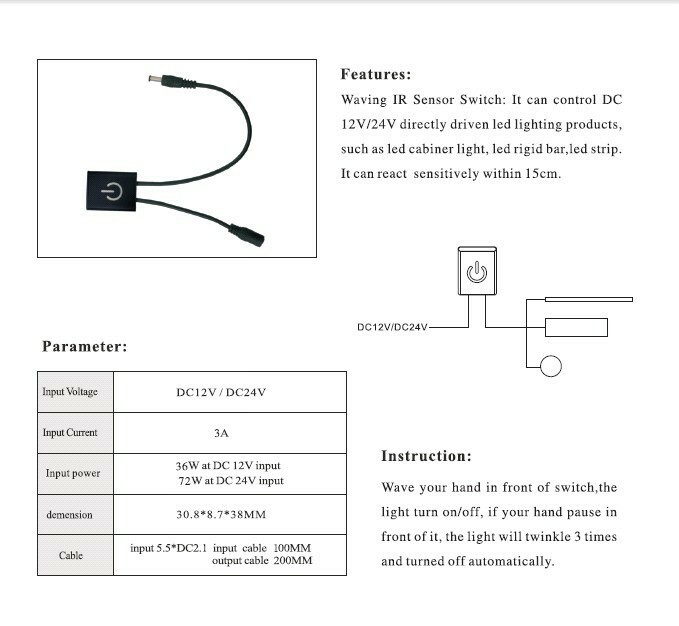 12V DC Waving IR Sensor Switch - VOLKA Lighting Pty Ltd. Waving IR Sensor Switch: It can control DC12V/24V directly driven LED lighting products, such as LED cabinet lights, LED rigid bar, LED strip lights. It can react sensitively within 15cm. Wave your hand in front of switch and the light turn on/off. If your hand pause in front of it, the light will twinkle 3 times and turn off, automatically. Click the button below to add the 12V DC Waving IR Sensor Switch to your wish list.